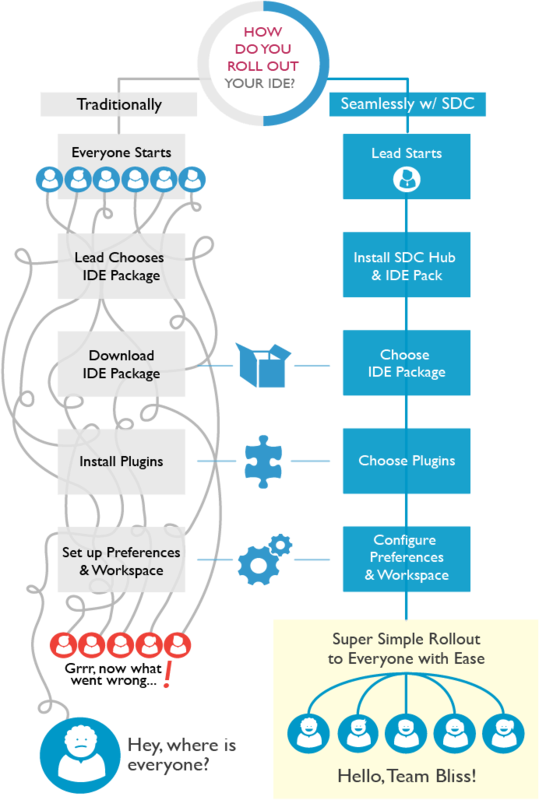 Deliver teams perfectly configured IDEs. Simply. Securely. New technology is being introduced at an ever increasing pace. That’s a good thing, right? It definitely can be. But it can also wreak havoc on your development environment. How do you get the right tools to everyone on the team, avoid introducing malicious software into your environment and make sure your teams are on the same page? And what about keeping up with licenses and customizing tool stacks specifically for different projects? IDE management hasn’t always been easy, but with Secure Delivery Center it can be. Create stable software in a collaborative environment. Make SDC the new sheriff and tame the Wild West. Keep your developers focused on writing awesome code. Stop wasting countless hours before a single line of code is written. That’s the average time lost annually to project on-ramping, keeping in sync, and releasing software—but with SDC, it doesn’t have to be that way. The SDC admin console makes it simple to create a perfectly configured tool stack and securely deliver it—so you keep your developers coding. That’s how long you can give SDC a try, absolutely free. So why not download it today? You have nothing to lose and so much to gain. So many organizations depend on SDC. Our customers often describe it as the one tool they never knew they needed, but now can’t live without. We give you two ways to try us out before you buy. Use our interactive demo cloud to get a taste of SDC. After that, you’ll want to download the SDC delivery hub to your desktop and take it for a spin. We get that hands-on learning is the best way to learn. Use our demo server to create a package and share with your teammates. Go ahead and download the Secure Delivery Center delivery hub to your desktop and try it FREE for 30 days! We hope that you were impressed with your test drive of SDC. If you have any further questions or would be interested in a product demonstration, we would love to help! Get SDC hosted for you! So much time is wasted before the typical developer gets to write a single line of code. Not only do you gain an average of 16 days a year from project on-ramping, synchronizing tools, and releasing software—you’ll also reduce the time wasted undoing damage from malicious software introduced into your environment. Are you ready for simpler IDE management? After reviewing a couple of low priority requests on potential SDC improvements with your team, I observed: The absence of any high priority issues speaks of how well SDC is working for us and that is a significant departure from the previous deployment methods we have used over the years.